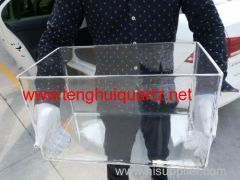 Donghai County Teng Hui Quartz Material Co.,Ltd. Donghai Tenghui Quartz Material Co., Ltd is located in the Chinese renowned and foreign "Crystal City" of Donghai County in Jiangsu province. Now our company has more than 100 staff,including 70 workshop workers, 20 inspectors , and more than 10 administrative staff. Highway, railway, civil aviation, shipping lead in all directions, traffic is very convenient. The company's products are various specifications of quartz glass tube and various non-standard quartz instrument. The factory location is very superior, the transportation is convenient, the product transportation convenient. Our advanced equipment, strong technical force, complete detection means measurement, quality assurance system integrity, provide high quality, high standard product for you, to meet the different requirements of users. The main products are: quartz tube, deep processing of quartz (quartz cover tube, quartz tube, quartz beaker, mouth burning quartz condenser, quartz crucible, quartz plate, quartz rod, quartz sheath, crystal powder); optical coating materials, the top of high purity silica products etc..
Our production of transparent fused quartz tube for outer diameter 0.5mm-300mm, wall thickness from 0.3mm - 7.0mm diameter specifications of products. Our factory can also provide a UV filter quartz tube and no ozone filter UV germicidal lamp with a quartz tube. And can be adjusted according to user requirements specifications required for the. Transparent even melt off hydroxyl quartz tube is one of the main products of our factory, the product quality is excellent, enjoy a high reputation in the field of domestic electric light source, need to cut into semi-finished products of the quartz tube according to user requirements for processing. Product marketing at home and abroad electron, metallurgy, chemical, electric light source industry. The aim of our company: quality assurance, credibility first, price reasonable. Welcome the old and new customer inquiries, to seek common development. Warmly welcome domestic and foreign businessmen to visit!